Yoshiko Uchida has written more than twenty-five books for children, including A Jar of Dreams and The Best Bad Thing . 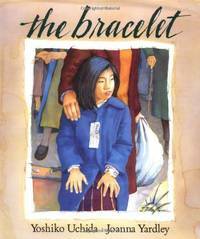 Many of Ms. Uchida's writings are inspired by her Japanese- American heritage. During World War II, she and her family were forced to live in West Coast internment camps. It is in this experience that The Bracelet is based. Philomel Books. Hardcover. 039922503X Item in very good condition! Textbooks may not include supplemental items i.e. CDs, access codes etc... . Very Good. Philomel Books. Hardcover. POOR. Noticeably used book. Heavy wear to cover. Pages contain marginal notes, underlining, and or highlighting. Possible ex library copy, with all the markings/stickers of that library. Accessories such as CD, codes, toys, and dust jackets may not be included. Penguin Publishing Group, 1993. Hardcover. Acceptable. Disclaimer:A readable copy. All pages are intact, and the cover is intact. Pages can include considerable notes-in pen or highlighter-but the notes cannot obscure the text. At ThriftBooks, our motto is: Read More, Spend Less.Dust jacket quality is not guaranteed. Penguin Publishing Group, 1993. Hardcover. Good. Disclaimer:A copy that has been read, but remains in clean condition. All pages are intact, and the cover is intact. The spine may show signs of wear. Pages can include limited notes and highlighting, and the copy can include previous owner inscriptions. The dust jacket is missing. At ThriftBooks, our motto is: Read More, Spend Less. Philomel Books. Hardcover. 039922503X Ships quickly. Mild wear. Orphans Treasure Box sells books to raise money for orphans and vulnerable kids. . Good. Philomel Books. Used - Very Good. Great condition for a used book! Minimal wear. Philomel Books. Used - Acceptable. Ships from Reno, NV. Former Library book. Shows definite wear, and perhaps considerable marking on inside. 100% Money Back Guarantee. Shipped to over one million happy customers. Your purchase benefits world literacy! Philomel Books. Used - Good. Shows some signs of wear, and may have some markings on the inside. Philomel Books. Used - Good. Ships from Reno, NV. Shows some signs of wear, and may have some markings on the inside. 100% Money Back Guarantee. Shipped to over one million happy customers. Your purchase benefits world literacy! Philomel Books. Hardcover. 039922503X Ships promptly from Texas. . New. 1993. NY: Philomel Books. Fine in Near Fine dust jacket. 1993. Hardcover. 039922503X . Illustrated by Joanna Yardley. First impression. Fine in a very near fine, price clipped dust jacket. .
1993-04-05. Good. Ships with Tracking Number! INTERNATIONAL WORLDWIDE Shipping available. May not contain Access Codes or Supplements. May be ex-library. Shipping & Handling by region. Buy with confidence, excellent customer service! Philomel Books. Hardcover. 039922503X Like New Condition. . Fine. Philomel Books. Hardcover. 039922503X New Condition. . New.